You can create your own oasis with a bedroom addition with limited budget. If your home is bursting at the seams, adding a bedroom can bring some much-needed space to increase comfort for your family. Options range from a state-of-the-art master suite to a simple budget bedroom without the frills. Understanding the cost of these options will help you choose the right option for your home and find the best type of bedroom addition to meet your needs and budget. Building out to add a bedroom allows you maximum flexibility. Adding a 14-by-16-foot master suite, including bathroom, over a crawlspace costs an average of $103,844 as of 2014, according to Remodeling. This type of project also offers a nearly 75 percent return on investment. Costs can vary significantly by region, as the same master suite addition costs an average of $137,840 in a high-cost urban market. Choose upscale finishes and a bit more space and your new bedroom costs could skyrocket, with an average price of $224,989 for an upscale master suite addition as of 2014. If you’re already satisfied with your master suite, but need more room for your growing brood, consider a simple one-story bedroom addition without the fancy closets or spacious bathroom. Ask the Builder estimates that room additions cost $115 to $200 per square foot as of 2014, putting the cost of a basic 10-by-10-foot bedroom between $11,500 and $20,000. If you need an extra bathroom to go with your new bedroom, plan to spend a minimum of $18,000 for a 6-by-8 bathroom addition, according to a 2012 report by KC’s Improvement and Construction Company Inc. The National Association of Realtors suggests you can save 20 to 60 percent by building your new bedroom over your porch, garage or a previous addition instead of adding on to your home. You’ll save money by avoiding major earthwork or building a foundation. A 2013 report by CNN estimates the cost of a new master suite installed over the garage at $50,000 to $80,000, which is well below the national average cost of adding a master suite over a crawl space. 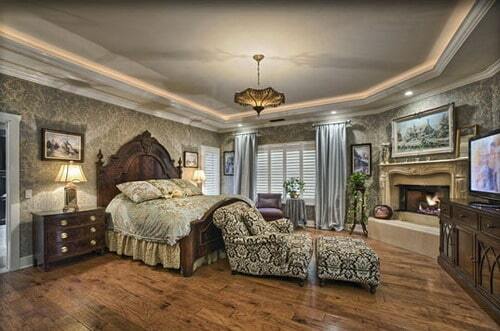 CNN suggests converting unfinished spaces like basements, garages and attics into bedrooms. This can save you 50 to 60 percent over the cost of adding on to your home because you eliminate the need for new foundations, roofing and exterior walls. You may also be able to make minor renovations to combine unused or underutilized spaces to make them more functional. For example, consider combining an out-of-the-way closet with a small guestroom to create a bedroom that works for your family. Converting an unfinished attic to a 15-by-15-foot bedroom with small bath costs an average of $49,438, with a nearly 85 percent return on investment, according to a 2014 report by Remodeling. The cost of this bedroom conversion can be as much as 30 percent higher in high cost-of-living areas. If your attic is already partially finished, you may be able to add a bedroom for slightly less. A 2013 report by CNN estimates that it costs between $20,000 and $30,000 to create a basic attic bedroom addition if you already have stairs. Add $10,000 for stairs, and be prepared to pay between $10,000 and $30,000 to add dormer windows to bring in light and extra ceiling height.